I seem to have bad candy thermometer karma. Every one I’ve ever purchased has either been miscalibrated from the get go, or has broken within the first few uses. So after three or so bum thermometers, I finally decided to cut my losses and get a digital instant read, as recommended by Cook’s. 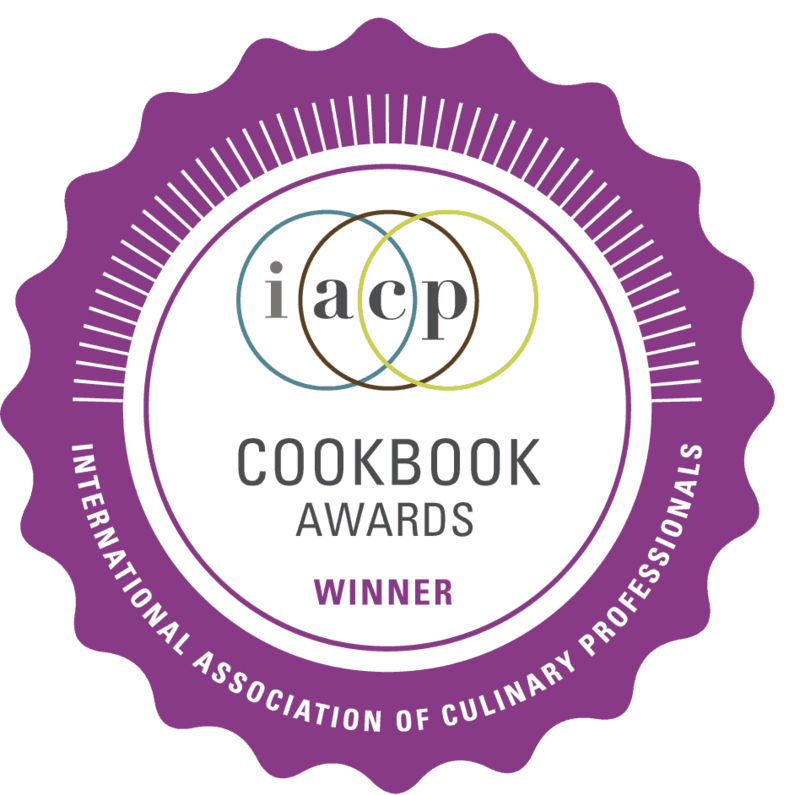 While it has never failed me as such, it’s not quite the same, as instant read is designed to probe a big lump of meat cooking in the oven, not be clipped onto the side of a pot to monitor the progress of molten sugar goo. But it comes in handy for a variety of uses, such as making sure the water for making green tea isn’t a hair over 190º. And Jay likes to bring it on trips to stick in rivers so he can brag about how cold they were when we swim. 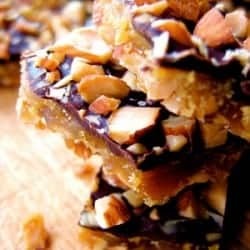 You can also use your instant read for making deliciously addictive, salty-sweet, buttery toffee, though you have to hold onto it with your delicate fingers hovering inches above bubbling, molten-hot sugar syrup. For a less risky grip, stick the thermometer through a hole in a slotted spoon and hold onto the spoon handle to dip the thermometer. 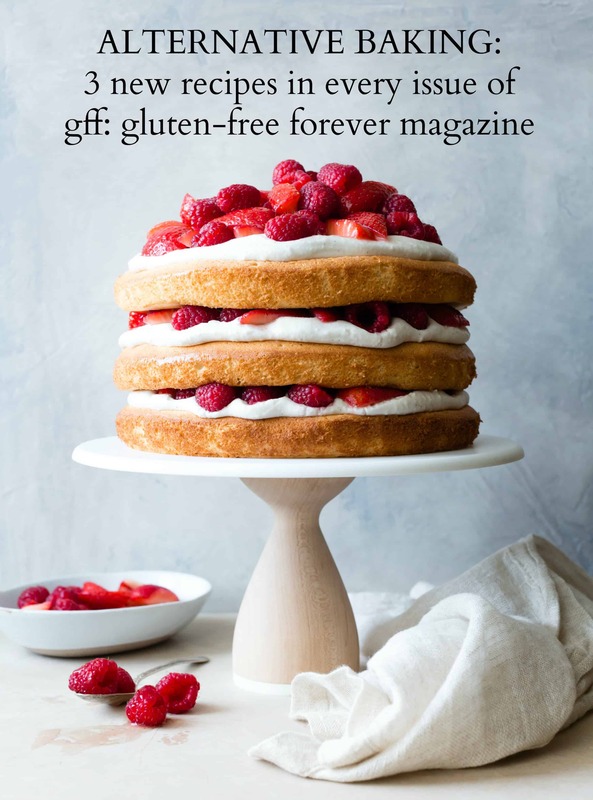 This recipe comes from my dessert/blogging idol, David Lebovitz, who manages not only to create incredible recipes for everything from ice cream to kim chee, but to write about them in a guffawing-out-loud funny manner. 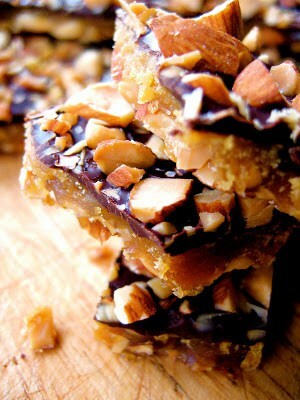 I’ve made his buttercrunch toffee several times since drooling over it’s glossy photo in Mr. L’s ice cream book, The Perfect Scoop, which is a must-have if you enjoy making ice cream. 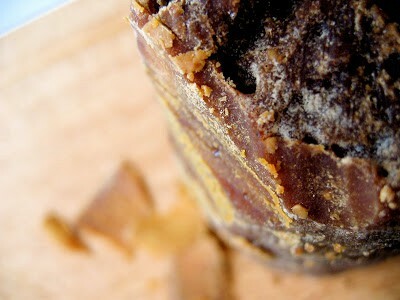 It makes a superb gift (I meant the toffee, but ditto for the book), but is also irresistible when sitting around your kitchen, in a jar on top of the fridge which your hand seems to be constantly opening against your will every time you walk by it, which happens with disturbing frequency. I added a Latin twist to a British favorite (or should I say ‘favourite?’) by subbing panela, an unrefined, cone-shaped sugar from Latin America, for the brown sugar, and dark rum for the water in the recipe. 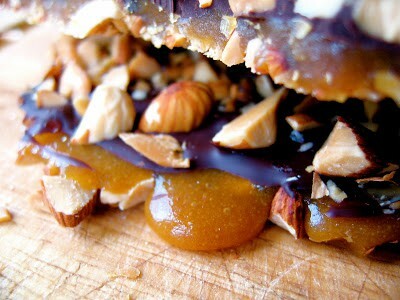 I also added a healthy dose of salt, fine to the toffee and flaky to the top. I dare you to be able to stop eating this. 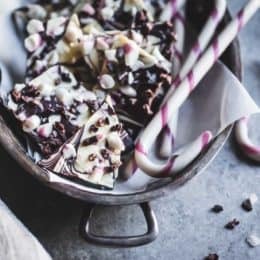 I hate to break it to you, but you do need a candy thermometer to make this, unless you want to risk ending up with ‘butter-chew’ or ‘butter-burnt’ toffee instead. Which you might anyway if you don’t have a reliable thermometer. If you are fearful, test your thermometer first in boiling water to make sure it registers 212º F.
You are going to love this homemade toffee! Servings: 12 servings (makes about 3 cups). Line a baking sheet with parchment paper for easy cleanup. 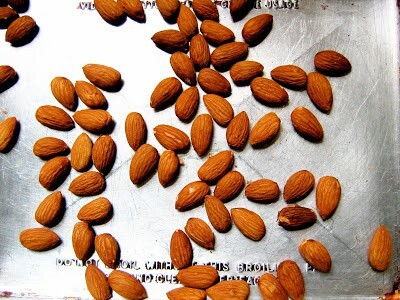 Spread out half of the chopped almonds into a 10" circle. Measure the salt and baking soda into a little container, and the vanilla into a separate container, and have them at the ready. 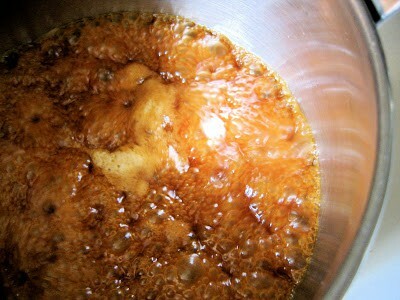 In a medium saucepan, combine the rum, butter and sugars. (Clip a candy thermometer onto the side of the pan if you have one; if using an instant read, just have it handy.) Cook over medium heat, stirring just enough to dissolve the sugar, then continue cooking, gently swirling the pan if the mixture begins to color unevenly, until a thermometer registers 300º. Immediately remove from the heat and quickly stir in the baking soda, salt and vanilla, mixing just to combine. Pour the mixture onto the circle of nuts, and quickly and gently spread to cover. Sprinkle the chocolate evenly over the top, let sit for a minute to melt, then spread into an even layer with an offset spatula or butter knife. (Or your finger. That works, too.) Sprinkle the remaining nuts over the top along with the flaky salt. Let cool at room temperature for 1 - 2 hours to set the chocolate, or, if it's warm, in the fridge. Break or chop into pieces. Store at room temperature for up to two weeks. Adapted from the illustrious David Lebovitz (who offers some good tips and encouraging words regarding candy making in the previous link). Panela is a cone-shaped sugar available at Latin-American groceries. If you can't find it, you can substitute muscovado or dark brown sugar. Use any nut you like as well; pecans, cashews and brazil nuts would both be lovely. 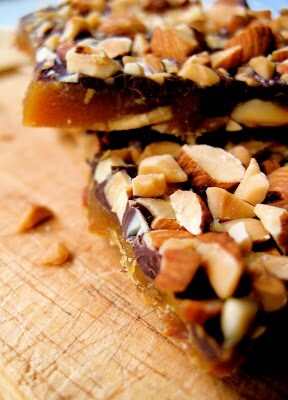 Sugar likes to crystallize, which is what you don't want when making toffee. 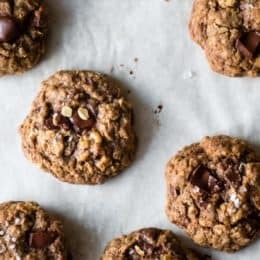 To minimize the chances of this happening, agitate the sugar mixture as little as possible while it's cooking and when spreading it over the nuts. Have a clean pastry brush and a cup of water handy to brush down the sides of the pot if any crystals start to form. All that being said, fear not: during the countless times I've caramelized sugar, I've only had it crystallize a couple of times. If your mixture does crystallize, you can try adding a few tablespoons of water to the pot, give it a stir (it will bubble vigorously - careful!) and return it to the heat. It may re-dissolve and be saved. Nutritional values are based on one of twelve servings. Panela is a cone-shaped sugar available at Latin-American groceries. If you can’t find it, you can substitute muscovado or dark brown sugar. 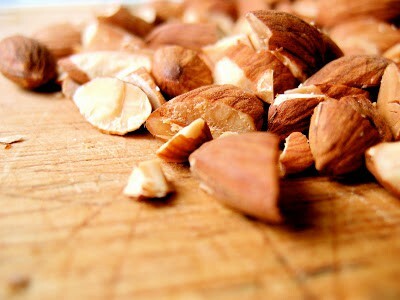 Use any nut you like as well; pecans, cashews and brazil nuts would both be lovely. 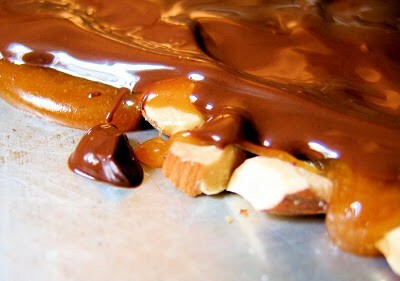 Sugar likes to crystallize, which is what you don’t want when making toffee. 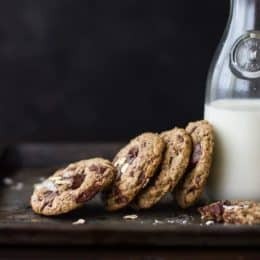 To minimize the chances of this happening, agitate the sugar mixture as little as possible while it’s cooking and when spreading it over the nuts. Have a clean pastry brush and a cup of water handy to brush down the sides of the pot if any crystals start to form. All that being said, fear not: during the countless times I’ve caramelized sugar, I’ve only had it crystallize a couple of times. 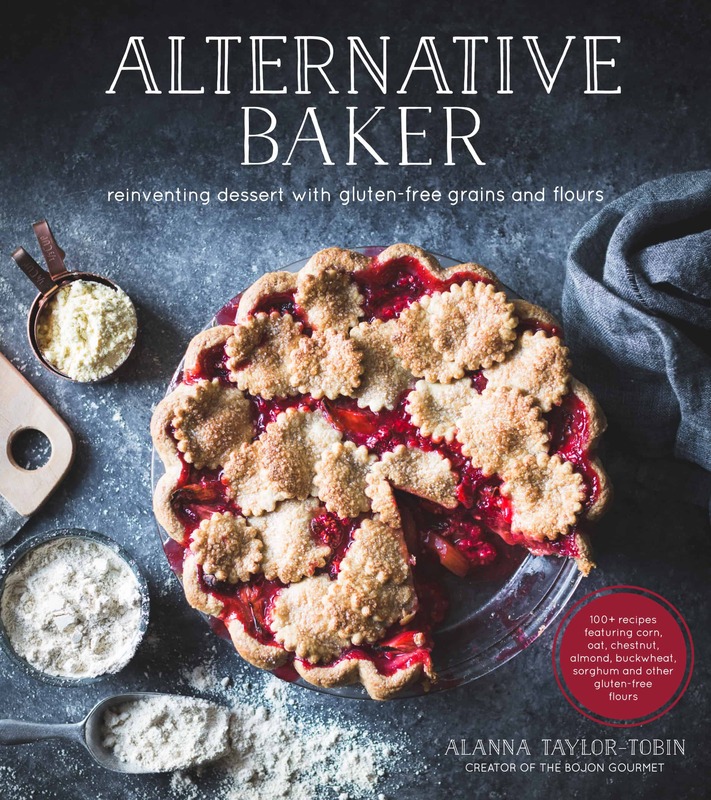 If your mixture does crystallize, you can try adding a few tablespoons of water to the pot, give it a stir (it will bubble vigorously – careful!) and return it to the heat. It may re-dissolve and be saved. Line a baking sheet with parchment paper for easy cleanup. Spread out half of the chopped almonds into a 10″ circle. 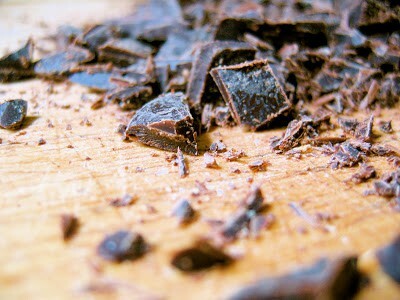 Let cool at room temperature for 1 – 2 hours to set the chocolate, or, if it’s warm, in the fridge. Break or chop into pieces. Store at room temperature for up to two weeks. If only you lived closer… it probably would!